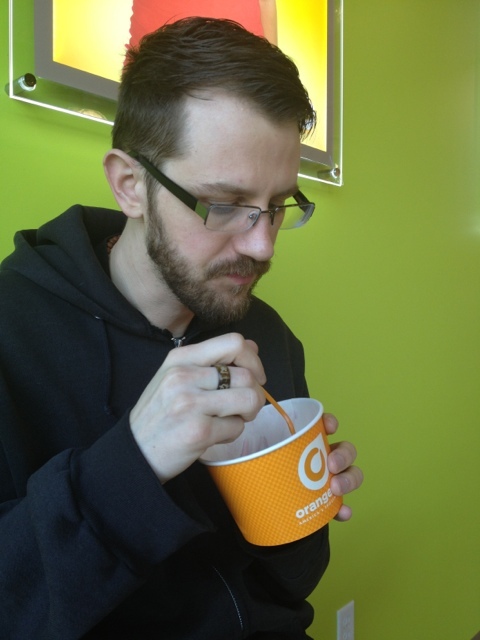 Last night, Craig and I discovered a new frozen yogurt place in Waukesha called Orange Leaf. After shopping at Target (my other happy place), we popped in to try it out. Craig tried white chocolate with blueberry and strawberry. He always gets berry flavors. I thought the interior was cute. Loved the orange tile on the back wall. The chairs were pretty fun too. 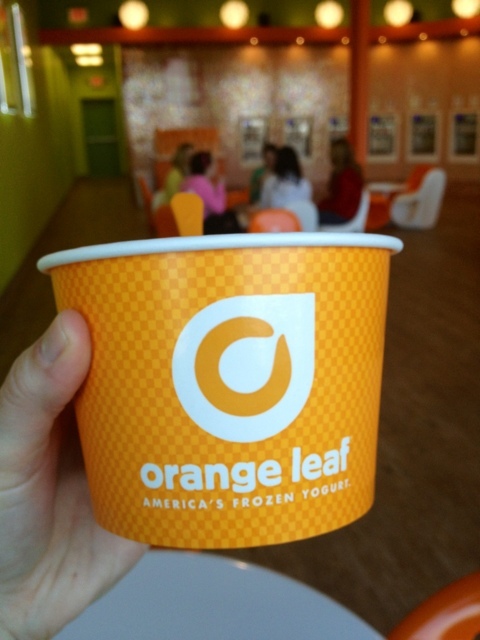 Overall, we liked the flavors that Orange Leaf offered and the taste was great. 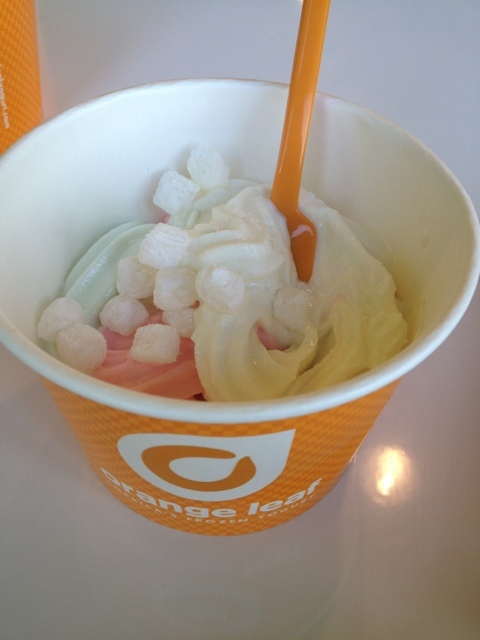 To compare it to other frozen yogurt places we have been to--I thought it was a bit more icy. This wasn't a bad thing, it was just different. This location just opened on Saturday and I guess the only other one in Wisconsin is in Madison. Love that the company website has all sorts of notes about the states their franchises are located in. For Wisconsin, they say, "Land of Cheese, Snow and Froyo!" 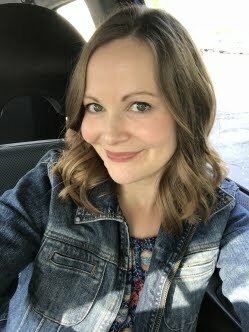 Are you a big frozen yogurt fan like me? I've loved it since I was a kid. TCBY was fantastic and I adored their white chocolate mousse. Having it in Florida last year brought back so many childhood memories for me. 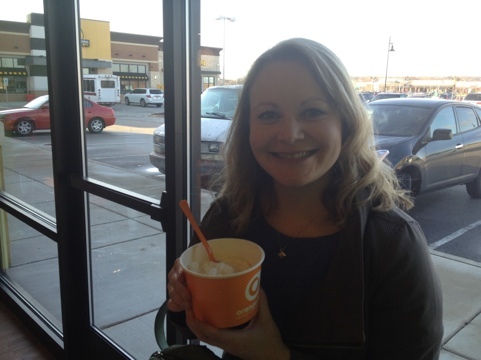 I was so disappointed when TCBY closed in our area, but I am happy to see more fro yo places popping up again. I love TCBY! My sister worked there when I was a kid and I have such vivid memories of going to visit her! 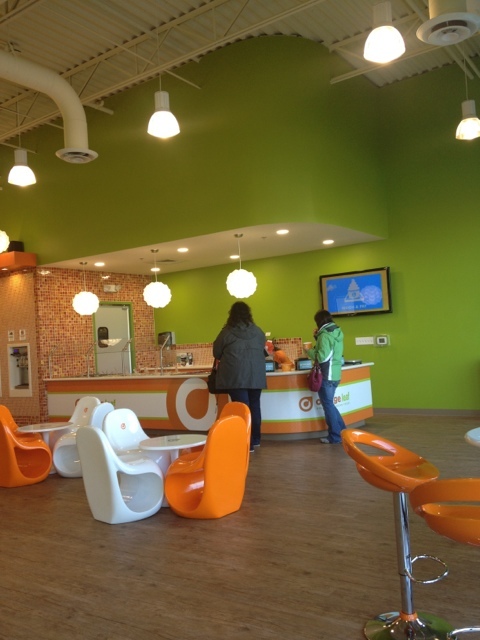 I wish there were more fro-yo places in Wisconsin. 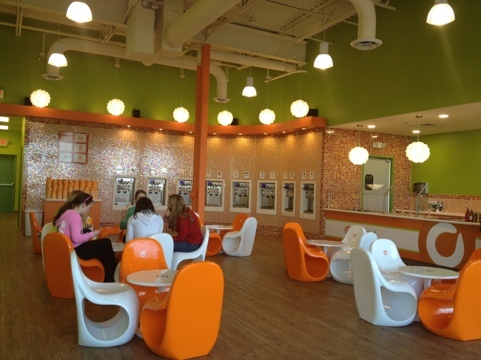 Have you been to Yo Mama in Wauwatosa? Love Yo Mama! It's really my fav of all of the fro yo places I have been to. Pinkberry is fantastic too, but I have only been there in Florida. 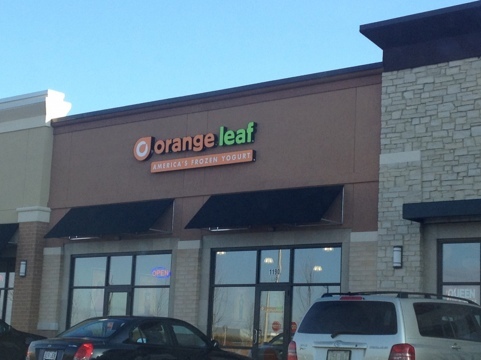 My wife and I went to Orange Leaf yesterday. We both loved it. We've been to Yo Mama many times and like it just a bit more than Orange Leaf, but only because we've tried more flavors at Yo Mama.